Medical marijuana undeniably provides many health benefits to patients both young and old. As conventional methods and prescription drugs have failed to treat or alleviate debilitating medical conditions, low-THC cannabis and medical marijuana has proved an effective option to provide patients with a naturally therapeutic alternative. While all medications have side effects, some can cause more harm than others. Certain prescription drugs can cause effects like organ damage or addiction. Medical marijuana has side effects, too, but they don’t result in long-term damage and can often go away when dosage is adjusted. Even some of the healthiest people begin to deal with chronic conditions as they age. As we get older, we become more susceptible to health problems that have symptoms that are difficult to manage. Fortunately, medical marijuana can assist with alzheimer’s, dementia, osteoporosis, chronic pain, arthritis, glaucoma and other ailments that many elderly people suffer from. Oftentimes the medicine available to you is dictated by your insurance, your doctor and your tolerance to certain side effects. There may be times when none of the medicines are working for you and there are no other options. Also, when you change or stop taking a medicine, you have to ween yourself off or on your dosage before making the switch. However, cannabis comes in a variety of dosages and formulations that patients can easily try out without worrying about withdrawal effects. If a medical marijuana patient experiences side effects such as paranoia or increased fatigue, their doctor can easily reduce the dosage level to the right fit for the patient. It doesn’t matter if you have one medical condition/ailment or multiple, it can take multiple prescription medications to fully address all of your symptoms. Managing multiple medications can easily become expensive and will have you running to the pharmacy frequently. With medical marijuana, you can easily address many ailments, from cancer to epilepsy. One stop at the dispensary lets you get an all-in-one solution for many of your health problems. Prescription drugs typically only come in a few forms and don’t always have alternative options available. However, while cannabis effectively treats many ailments, it can also be consumed in many different ways. If a patient prefers not to smoke, there are capsules, oils and even edibles available as well as many other alternatives. Medicinal cannabis doesn’t just offer an alternative medicine — it also involves a compassionate healthcare experience. Since medical marijuana is so versatile and each individual is unique, physicians work one-on-one with you. They look at your specific ailments and determine what would serve as the best way to intake cannabis, especially if your ability to consume medicine in certain ways is limited. Patients can use cannabis as a supplement to their prescription drugs or as a total replacement. Of course, before you make a decision regarding any kind of medicine, consult your doctor first. 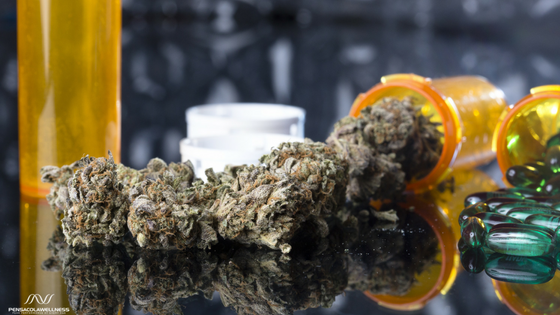 Do you think you or your loved one might qualify for medical marijuana? If so, you can learn more about what health conditions are eligible under Florida law, see our office policies and fees, find dispensaries or request an appointment at Pensacola Wellness Solutions here.